What Happens if it Gets Wet? Its like dropping a toaster in the bath tub…right? Well actually that’s totally wrong. Unfortunately the general public’s view of electricity and water has been extremely skewed, due to many Hollywood movies and myths. 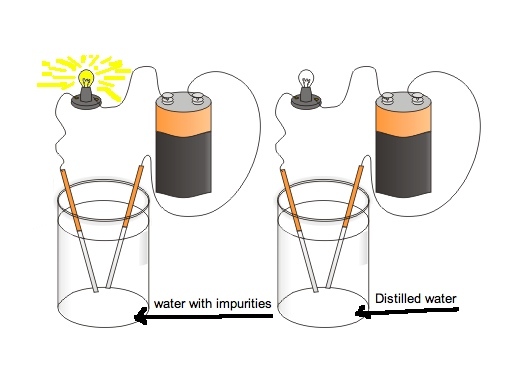 The truth of the matter is that distilled water is actually completely NON-conductive! Yes pure water is actually an insulator, but when things are added to the water like salt, dirt, sand, or other chemicals, then the conductivity increases as the amount of impurities increase. Therefore most rain water (since evaporated) is rather clean and contains little to no impurities and has a very poor conductivity. I decided to try an experiment and leave my motorcycle out in the rain for an entire day, it literally rained for almost 9 hours straight on the motorcycle. 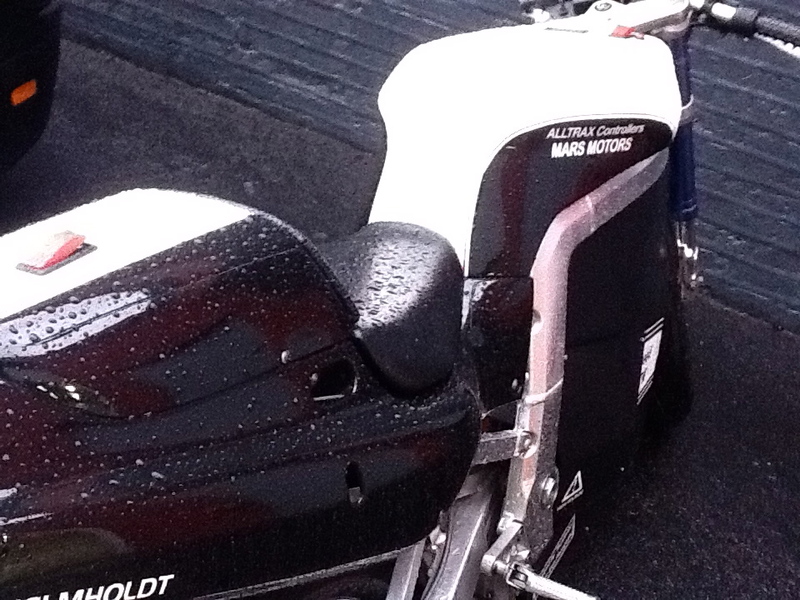 A close-up photo to show how wet the bike was. I was a little nervous about what could possibly happen, but I was willing to take the risk for the sake of science! The motorcycle worked great, there was literally not one problem after 9 hours of rain all over the vehicle. 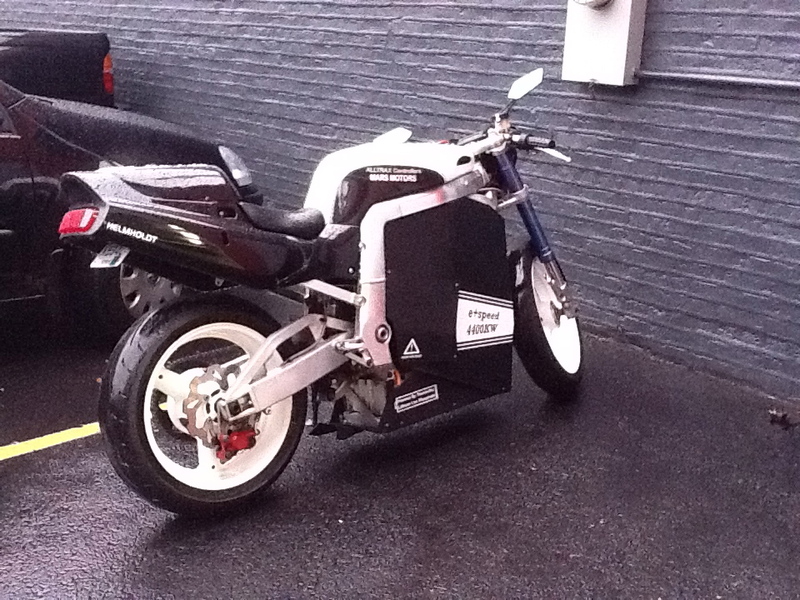 Also note that this motorcycle was not designed to be “water, or rain proof”, therefore if there are design improvements to make it even more water tight, there should never be a problem whatsoever with rain, puddles, or moisture. 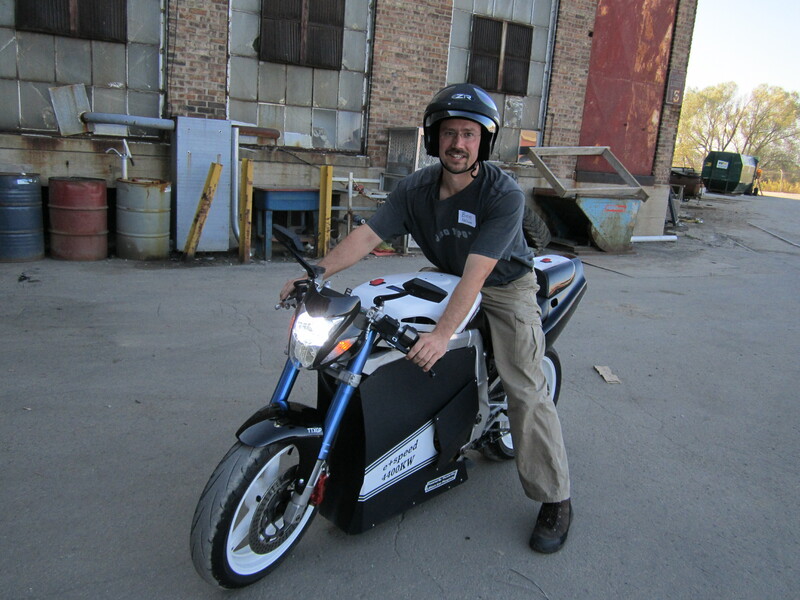 A few months ago while displaying the E*speed motorcycle at the Detroit Maker fair I had the pleasure of meeting Ben Nelson, a fellow EV motorcycle builder, EV car builder, expert camera operator and all around nice guy! 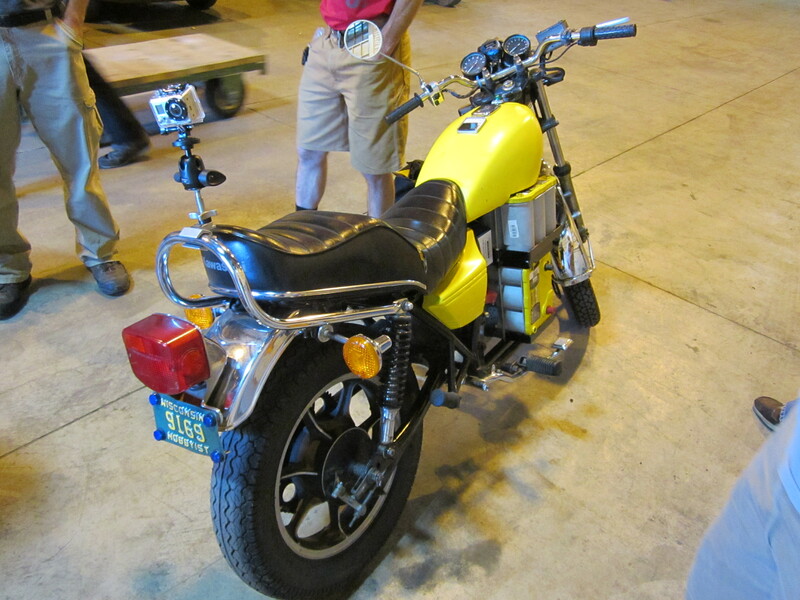 He invited me to the first official EV meet at the Milwaukee makerspace. Many EV’s came and they were all quite impressive, but best of all we got to see many EV’s still in progress being built in the Makerspace. 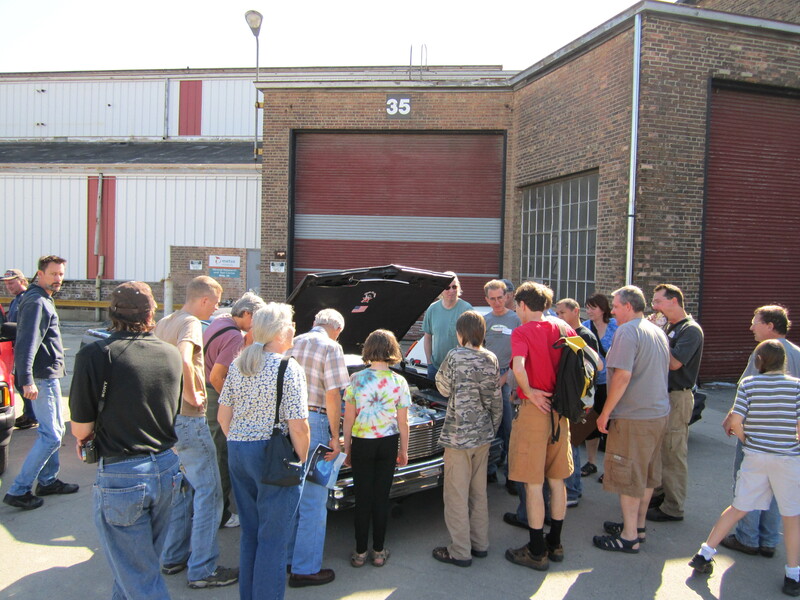 everyone starring at the impressive Lithium powered EL Camino! 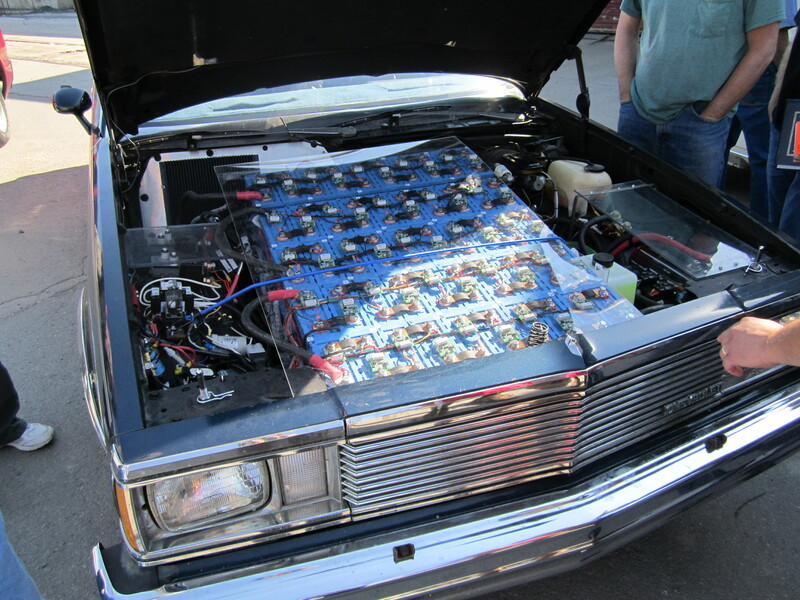 I really liked how he installed the entire drive-train under the hood, leaving the bed empty and ready to be used like a normal pick-up. Ben took my motorcycle out for a spin, I think the grin says it all! 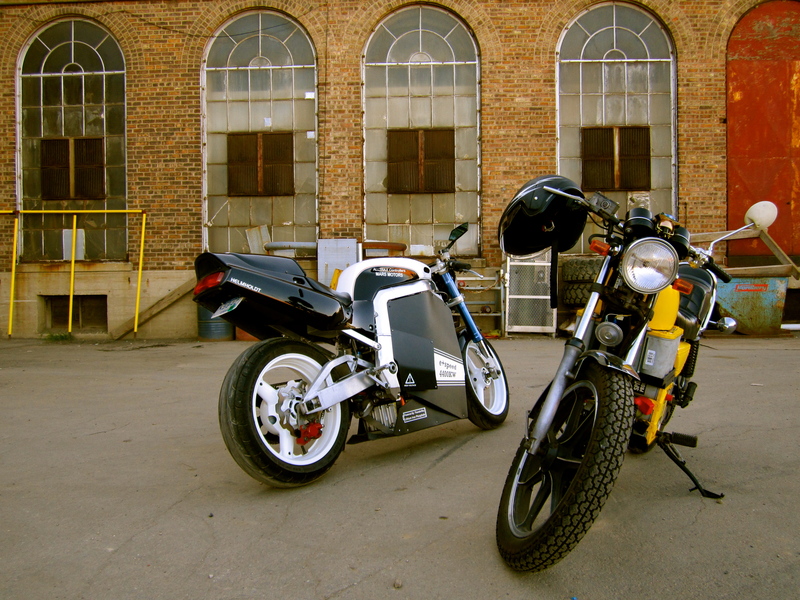 A great photo of 2 electric motorcycles! Ben also made a great quick video of us riding around the parking lot, check it out. Thanks to all at the Milwaukee Makerspace, please visit their website, there may be a makerspace in your city too!